double strong head line...what do they mean? hello everyone, i have some question about double strong head line is big confuse that how can we read it? 1.double strong head line in right hands...what do they mean? 2.the line that join to the end of head line in left hand...what do they mean? what the head line mean? 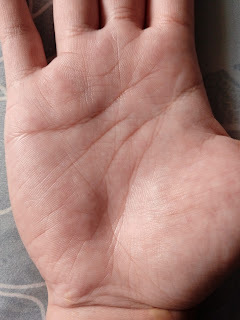 How can we read the palm like this? Re: double strong head line...what do they mean? 2nd line is starting roughly between age of 25 to 30. It indicates person developing/realizing his new potential. It also mean income of 2 sources, both being successful in this particular palm as both lines looks equal in strength. Hey !! I've got exactly the same line !! I thought I was one of the only ones to have it... I'm not english nor american, so I can't explain exactly with all the right words, but this is a line on the "Mars thing" (mount or something like that), so it shows that you can be agressive (I think), and have many ordeals in your life, maybe a difficult life ? And I also read that it means that you can have a lack of self-confidence in life... Also, you're honest, and I read some things else... Mine is joined with the heart-line, head-line with a kind of "weird" shape (not that weird, but I don't know what it is)... 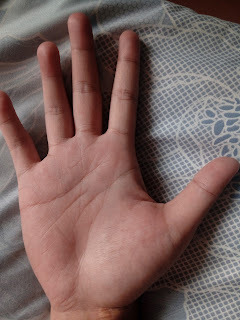 I have it only on my left hand. And I don't think this is a head line.It doesn't look like one. People may have lines on this Mars mount or thing, and it means something.I'm talking about the first pictures of course. Whose hand is this and what is the age of this person and with which hand does he write? aki_ke wrote: hello everyone, i have some question about double strong head line is big confuse that how can we read it? chiromancy-lover wrote: And I don't think this is a head line.It doesn't look like one. People may have lines on this Mars mount or thing, and it means something.I'm talking about the first pictures of course. 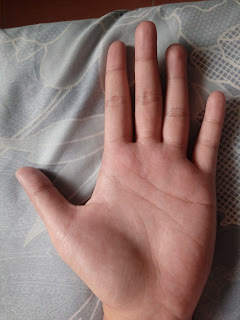 I always go by the effect of that double head line on the palm.Look at the poor Life Line and then you will understand what the head line has done to it as also the Girdle of Venus. 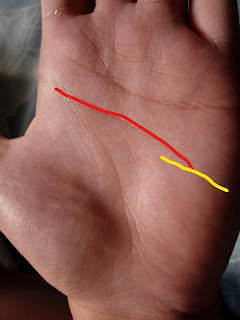 According to doubling principle of head line is the rarest position in any one hand, An impressive example for this was Famous Palmist Count Louis Hamon (Cheiro) who got immense reputation in particular palmistry field, As double head line shows the owner of this use to apply double mind at the same time and get accuracy which ordinary one can not. In Indian mythology and old epics shows that the person having two head line shows its owner having two mothers....as it being known by mother line too..Quality of head line if sharp and deep then look at which age group its diverting will give extra sharp mind according to its owner other line combination.. Over all double head line good as it is by doubling principle and having deep knowledge but if its owner able to marketing himself in front of society. Please post the palm prints. Without the palm print it becomes difficult to comment.